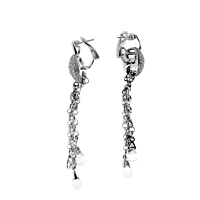 These Horsebit Earrings from Gucci are nothing short of ravishing! Sleek 18k White Gold sculpted into intertwined yet aesthetically distinct components dangles 2.83" in length, offering a shimmering sensation which is as pleasing to admiring eyes as it is to a fashionista's sense of style. A full 3.10ct of Round Brilliant Cut Diamonds complete the look with just the proper amount of radiant beauty.